Henry David Thoreau was born Concord Massachuset 1817. This is the 195th anniversary of his birth. Thoreau was an abolitionist, a naturalist, a lecturer, a historian, a teacher, a surveyor, a pencil maker and a writer. He was inspired by his friend Emerson..
Thoreau made most of his money through surveying. 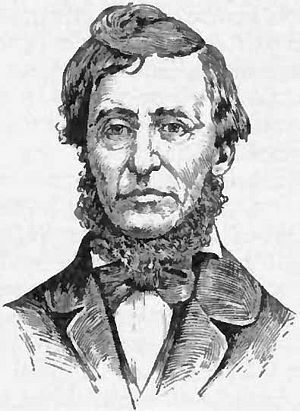 He wrote that surveying “seems a noble employment which brings you within hearing of [the birds].” He also helped to make Thoreau & Co., his family’s pencil making company one of the best in the America when he developed a way of mixing clay with graphite to make a superior, “smudge-free” pencil. Thoreau loved nature. He would take long walks in the woods and he collected specimens of herbs, leaves and flowers, storing along the way. He stored them in his hat until he got home., then he or his sister Sophia carefully press them. He carried a notched stick that acted as both walking stick and a measuring stick. He also brought along a copy of Alexander Wilson’s bird anthology to identify the birds in the trees. In 1845 he built his own cabin near Walden Pond, on property owned by Emerson, and lived for two years. His goal was to “live deliberately, to front only the essential facts of life, and see if I could not learn what I had to teach.” He wrote about his time there in A week on the Concord and Merrimack Rivers (a memorial to his late brother) and, after seven full drafts, Walden. His work as an abolitionist included “Slavery in Massachusetts, and a trio of essays about John Brown. This entry was posted on Thursday, July 12th, 2012 at 2:48 pm	and tagged with Henry David Thoreau, Walden, Walden Pond and posted in American History, History, postaday, Thought of the Day, Today's Birthday, United States, Writing. You can follow any responses to this entry through the RSS 2.0 feed. Quite truly quoted : There is no remedy for love but to love more….